The stock was up 5% to Rs 477 on the BSE in intra-day trade on Monday, rallied 50% from Rs 317 on February 4, 2019, against 2.7% decline in the S&P BSE Sensex. Shares of Dilip Buildcon (DBL) were trading higher for the 10th straight session at Rs 477 apiece, up 5 per cent on the BSE in an otherwise weak market. The stock of roads and highways company has outperformed the market by surging 50 per cent in the past two weeks from level of Rs 317 on February 4, 2019. In comparison, the S&P BSE Sensex was down 2.7 per cent during the same period. DBL had reported 26 per cent year-on-year (YoY) growth in net profit at Rs 209 crore in December 2018 quarter (Q3FY19). Operational revenue grew 28 per cent at Rs 2,493 crore against Rs 1,948 crore in the corresponding quarter of previous fiscal. Ebitda (earnings before interest, taxation, depreciation and ammortisation) margin remained at the same level at 17.9 per cent as compared to a year-ago quarter. The company said an increase in revenue is primarily on account of the conversion of order book through superior execution and operational excellence. DBL has received orders worth of Rs 1,809 crore during the quarter including Indore and Bhopal Metro project worth Rs 475 crore. 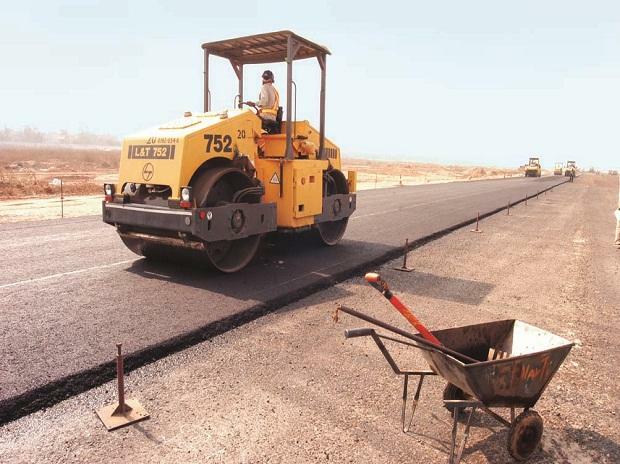 As of December 31, 2018, the company’s order book position stood at Rs 23,100 crore with roads segment contributing 81 per cent to the total order book. “After already lowering the FY19E guidance by 5 per cent, DBL now remains confident of achieving around Rs 94-95/115 billion revenue in FY19/20E respectively. While DBL will prefer (engineering procurement and construction) EPC over hybrid annuity mode (HAMs) in roads, it will continue to look at less capex intensive projects like micro-irrigation, dams and metro projects,” analysts at HDFC Securities said in result review. Even though the newer HAMs are facing some challenges before moving into execution, DBL continues to demonstrate its superior execution capabilities on its existing projects (with around Rs 50 crore bonus expected on the Lucknow Sultanpur stretch, around 8 months before time). We remain constructive, the brokerage firm said in a report with ‘buy’ rating on the stock. “We expect the pace to at least hold if not improve, simply considering the quantum of projects awaiting appointed dates across its EPC and hybrid annuity portfolios. Debt has risen, but with the pending mobilisation advances from yet not- appointed projects, an improvement is not ruled out. Ample assurance and significant progress on its hybrid projects instill, in us, confidence and lead us to maintain our Hold rating,” analysts at Anand Rathi Share and Stock Brokers said in company update. In the past one year, DBL has underperformed the market by falling 64 per cent, against 5 per cent rise in the benchmark index till February 4. At 11:18 am, DBL was trading 4 per cent higher at Rs 466 on the BSE, as compared to 0.67 per cent fall in the S&P BSE Sensex. A combined 669,000 equity shares changed hands on the counter on the NSE and BSE so far.